Many make the pilgrimage to Plymouth every summer to see one of the places where this country began, but Quincy, New Bedford	and Fall River are also worth a visit. Of the many communities on the South Shore of Massachusetts Bay, Plymouth, 40 miles (63 km) south of Boston, is easily the most famous. It makes a logical day trip from Boston, or a stop on the way to or from the city. You can visit the historic city of Quincy, only 10 miles (16 km) south of Boston, reachable by MBTA Commuter Rail train. Quincy is home of Adams National Historical Park, on the same excursion to see the birthplaces of John Adams and John Quincy Adams, the family farm at Peacefield, and United First Parish Church, which the Adams family attended and supported, and in which these two Presidents of the United States are buried. Farther south, you may also want to visit the 19th-century whaling port of New Bedford and the old textile center of Fall River on your way to Cape Cod, Providence or Newport RI. 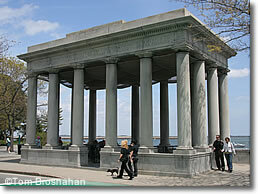 The monumental shelter covering Plymouth Rock, where the Pilgrims supposedly first set foot in Plymouth (1620).